Amy Lynn Hartzler (née Lee; born December 13, 1981), known professionally as Amy Lee, is an American singer, songwriter, record producer and multi-instrumentalist. She is the co-founder and lead vocalist of the rock band Evanescence. Along with her contributions with the band, Lee has also participated on numerous other musical projects including Walt Disney Records' Nightmare Revisited and Muppets: The Green Album. Lee has performed collaborations with artists such as Korn, Seether, and David Hodges. Lee is also the American chairperson for the international epilepsy awareness foundation Out of the Shadows. During Evanescence's hiatus, Lee embarked on her film score career in 2013 by composing the soundtrack to War Story (2014) and Indigo Grey: The Passage (2015) with cellist Dave Eggar, and the song "Speak to Me" for the film Voice from the Stone. Lee cites influences ranging from composers such as Mozart and Danny Elfman, to artists like Björk, Tori Amos,Plumb and Shirley Manson. She received the Songwriter Icon Award in 2008 from the National Music Publishers Association. In 2012, she won Best Vocalist at the Revolver Golden Gods Awards and is also named Rock Goddess of the Year at the Loudwire Music Awards. She won an award for Best Film Score for Indigo Grey: The Passage at the Moondance International Film Festival in 2015. Amy Lee was born in Riverside, California, to parents John Lee, a disc jockey and TV personality, and Sara Cargill. She has a brother named Robby and two sisters, Carrie and Lori. Lee had a younger sister who died in 1987 at the age of three from an unidentified illness. The song "Hello" from Fallen has been reported to have been written for her late sister, as well as the song "Like You" from The Open Door. Lee took classical piano lessons for nine years. Her family moved to many places, including West Palm Beach, Florida, and Rockford, Illinois, and eventually settled in Little Rock, Arkansas, where Evanescence was formed. Lee graduated from Pulaski Academy, a private school in Little Rock, in 2000. She briefly attended Middle Tennessee State University in 2000 to study music theory and composition but dropped out to focus on Evanescence. Lee co-founded the rock band Evanescence with guitarist Ben Moody. The two met at a youth camp after Moody heard Lee playing Meat Loaf's "I'd Do Anything for Love (But I Won't Do That)" on the piano. Within a month, the pair were playing acoustic sets at Arkansas book stores and coffee houses, and they eventually recorded two EPs, Evanescence EP (1998) and Sound Asleep EP(1999), selling them at various local venues. In 2000, Evanescence recorded the longer EP Origin. This demo contains three songs from the debut album Fallen written by Lee and Moody: "Whisper", "Imaginary" and "My Immortal". 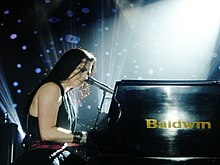 Whereas "Whisper" and "Imaginary" were altered before being included on Fallen, "My Immortal" is virtually unchanged, apart from additional string arrangements. A later band version of "My Immortal" was made available for download for those who had bought an official version of Fallen through their web site, but required that a CD checker program also be downloaded for verification before it would play. The band version was included on later copies of Fallen, notably the Brazilian, Bolivian, and Argentine editions. On January 3, 2014, TMZ reported that Lee had sued Evanescence's label, Wind-up Records, for $1.5 million in unpaid royalties.In March 2014, via her Twitter account, Lee announced that she had been released from her Wind-up Records contract and was now an independent artist. In 2004, Lee claimed to be working on music for The Chronicles of Narnia: The Lion, the Witch and the Wardrobe, but that the music was rejected by the studio for being "too dark." However, the producers of Narnia stated that Lee was never asked to compose any music for the film, whose score was written by Harry Gregson-Williams, and that "No Evanescence music was planned for the soundtrack." While there was some speculation that one of the supposed songs had been cut and used in several tracks of The Open Door, Lee stated this was not true except for part of it being used to segue into the last track of the album, "Good Enough". In June 2008, the National Music Publishers Association presented Lee with their 2008 Songwriter Icon Award, which "recognizes outstanding songwriters for their personal achievement." Lee stated during an October 2008 interview with The Gauntlet that she did not know whether or not she would begin a solo career, saying that she was "at a point where I don't know what is next." She noted that Evanescence was still together as a band but that she found touring to be monotonous. She reiterated that she was continuing to write songs, although she did not yet know what purpose they would serve. In March 2015, Lee and Eggar announced that they were recording music, along with Chuck Palmer, for Hammerstep's short film Indigo Grey: The Passage, which was released on September 14, 2015. The film featured the songs "Between Worlds" and "Resurrection". On August 13, 2015, Lee composed and recorded "Speak to Me" - the title song to Eric D. Howell's upcoming film Voice from the Stone. The accompanying music video was also directed by Howell. It was filmed on October 22, 2015, on the Castle of Celsa estate near Siena, Italy. During a radio interview in July 2015, Lee said that she had been recording cover songs and expressed an interest in releasing them online. On October 27, 2015, she released the first song from the collection with Portishead's 1994 song "It's A Fire",followed by U2's 1987 song "With or Without You" on November 10, 2015, Led Zeppelin's 1971 song "Going to California" on December 1, 2015, and Chris Isaak's 1996 song "Baby Did a Bad, Bad Thing" on December 15, 2015. They are featured on Lee's debut extended play, Recover, Vol. 1, which was released on February 19, 2016. The cover songs are accompanied by music videos directed by Eric Ryan Anderson. Lee confirmed in an interview with Rolling Stone that she is "definitely working and making music with every intention of people hearing it at this point," as of October 2015. She also stated that she does not have "any news or plans" for new Evanescence music, but assured fans on Twitter that the band has not broken up saying, "We don't follow the rules of a commerce-driven timeline. Inspiration drives us. We're wide open." She later stated during an interview with Loudwire that "there is Evanescence in the future". 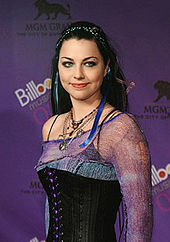 In December 2015, Lee confirmed that she plans to complete some songs from an Evanescence album (originally produced by Steve Lillywhite) that was rejected by Wind-up Records in 2010. She explained that she was "devastated" and "furious" over the rejection, but was determined to move forward and ended up being "angry enough to write Evanescence's heaviest album." Although three songs from the Lillywhite sessions ended up on Evanescence, Lee admitted, "I was still left feeling unsatisfied about what I lovingly refer to as my 'broken record.'" Lee has a recognizable fashion style, marked by her occasional use of gothic make-up and taste for Victorian-styled clothing. She also designs many of her own clothes, including those worn in the music video for "Going Under", and the dress worn for the cover of The Open Door and the dress she wore to the Nobel Peace Prize Concert in 2011. After she designed the dress she wore at the 2004 Grammy Awards, she chose Japanese designer H. Naoto to make it for her. She at one point had a piercing on her left eyebrow, which is visible on the cover of Fallen. In an interview with VEVO stylized, Lee showcased and explained her fashion style, commenting that she would rather make her own clothes because it is hard to find what she exactly wants elsewhere. In an interview with AOL, Lee stated that her daily style is very different from when she performs; pointing out that she was wearing "something floral" during the interview. She explained that her on-stage wardrobe was meant to preserve the atmosphere of the songs and complete the image. In another interview, she stated that when the band first started performing, she would wear corsets to avoid diluting the band's public image, but has gradually become more comfortable with her own style. Her current on-stage style is often characterized by boots, a simple black tank top, a long skirt and various ornaments and accessories. Jump up^ Montgomery, James (August 11, 2014). "Get Free: Amy Lee on Artistic Independence, the Future of Evanescence". Rolling Stone. Retrieved October 29,2015. ^ Jump up to:a b "Why Epilepsy?". OutoftheShadows.com. Archived from the original on November 8, 2006. Retrieved November 7, 2006. ^ Jump up to:a b "Interview with Evanescence singer Amy Lee". gURL.com. Archived from the original on November 4, 2006. Retrieved November 7, 2006. Jump up^ Farias, Andree (April 10, 2006). "Pre-Evanescence". Christianity Today. Christianity Today International. Archived from the original on November 11, 2006. Retrieved November 7, 2006. Jump up^ Lee, Amy (April 22, 2012). "Met one of my idols today...". Twitter.com. Retrieved May 23, 2014. ^ Jump up to:a b c Butler, Susan (June 10, 2008). "NMPA Honors Amy Lee, Sen. Leahy". Billboard.biz. Archived from the original on August 22, 2009. Retrieved June 25,2009. ^ Jump up to:a b "'Revolver Golden Gods' 2012: Press Conference Highlights, Interviews Available". Blabbermouth.net. February 24, 2012. Retrieved February 28, 2012. ^ Jump up to:a b Kaufman, Spencer (January 16, 2013). "Evanescence Singer Amy Lee Wins Rock Goddess of the Year in the 2012 Loudwire Music Awards". Loudwire. Retrieved June 17, 2013. ^ Jump up to:a b "2015 Competition Results – Films and Film Scores". Moondance International Film Festival. Retrieved August 16, 2015. Jump up^ Monger, James Christopher. "Amy Lee: Biography". Billboard.com. Rovi. Archived from the original on February 26, 2015. Jump up^ Whitburn, Joel (2008). Joel Whitburn Presents Rock Tracks 1981-2008. Record Research. p. 143. ISBN 0-89820-174-8. Jump up^ Odell, Michael (April 2004). "Survivor!". Blender magazine. Archived from the original on January 24, 2007. Retrieved October 18, 2006. Jump up^ Bottomley, C. (September 18, 2006). "Evanescence: Amy Lee Explains the New Songs". VH1.com. Archived from the original on October 28, 2007. Retrieved October 8, 2006. Jump up^ Passy, Charles (July 23, 2004). "Home visit brings her to life". The Indianapolis Star via EvBoard.com. Retrieved January 22, 2014. Jump up^ "Amy's bio". OutoftheShadows.com. Archived from the original on November 8, 2006. Retrieved November 7, 2006. Jump up^ "Amy Lee '00". Pulaskiacademy.org. October 18, 2011. Retrieved January 22,2014. Jump up^ Morse, Steve (May 23, 2003). "Evanescence is No Disappearing Act". The Boston Globe. Jump up^ Robertson, Jessica (October 19, 2007). "P's & Q's: Amy Lee Finds Solace in Marriage and Music". AOL.com. Archived from the original on October 21, 2007. Retrieved October 19, 2007. Jump up^ D'Angelo, Joe (February 27, 2004). "Evanescence – The Split". MTV News. Archived from the original on November 13, 2006. Retrieved November 7, 2006. ^ Jump up to:a b Bakker, Tiffany (January 9, 2004). "Moody blues". The Sydney Morning Herald. Retrieved November 7, 2006. Jump up^ "My Immortal Band Version". Evanescence.com. Archived from the original on June 15, 2004. Retrieved March 10, 2007. Jump up^ "'Evanescence' Singer Sues - Our Very Own Label is Our Worst Enemy". TMZ.com. January 3, 2014. Retrieved January 22, 2014. Jump up^ Hartmann, Graham (January 3, 2014). "Evanescence Singer Amy Lee Reportedly Suing Record Label for More Than $1 Million". Loudwire.com. Retrieved January 4, 2014. Jump up^ Hartmann, Graham (March 20, 2014). "Evanescence's Amy Lee: 'For the First Time in 13 Years, I Am a Free and Independent Artist'". Loudwire.com. Retrieved March 20, 2014. Jump up^ "Discography / Lyrics / Audio Clips". DavidHodges.info. Archived from the original on October 13, 2006. Retrieved November 7, 2006. Jump up^ D'Angelo, Joe (August 13, 2003). "Borland, Bowie, Maynard James Keenan Ready To Unveil Hush-Hush Project". MTV News. Retrieved March 8, 2007. Jump up^ D'Angelo, Joe (November 18, 2004). "Evanescence's New Sound Is Reminiscent Of ... Evanescence". MTV News. Retrieved July 6, 2007. Jump up^ "Wardrobe closed to Evanescence singer". The New Zealand Herald. November 27, 2007. Retrieved July 6, 2007. Jump up^ Lee, Amy (July 13, 2006). "Discussion of The Open Door album". EvBoard.com. Retrieved August 9, 2007. Jump up^ Kaufman, Gil (November 17, 2006). "Timberlake's Brainstorm: Johnny Cash Video With Kanye, Jigga, Depp, Others". MTV News via VH1.com. Archived from the original on December 7, 2006. Retrieved November 30, 2006. ^ Jump up to:a b Eells, Josh (October 2006). "Amy Lee: Back in Black". Blender. Archivedfrom the original on September 6, 2007. Retrieved January 9, 2007. Jump up^ Harris, Chris (December 13, 2006). "Korn Quiet Down With The Cure, Amy Lee For 'MTV Unplugged'". MTV.com. Archived from the original on March 2, 2012. Jump up^ "Megadeth's Mustaine, Evanescence's Lee Featured In 'Rock Band Commeth' Mockumentary". Blabbermouth.net. November 7, 2007. Archived from the original on December 13, 2007. Retrieved November 8, 2007. Jump up^ Donahue, Ann (August 5, 2008). "Elfman, Korn, Plain White T's Revisit 'Nightmare'". Billboard.biz. Archived from the original on August 11, 2008. Retrieved August 9, 2008. Jump up^ "Jonathan Davis, Marilyn Manson, and Amy Lee Featured on "Nightmare Before Christmas" CD". RevolverMag.com. August 8, 2008. Archived from the original on August 24, 2008. Retrieved September 4, 2008. Jump up^ "Evanescence Singer To Perform At 'Nightmare Before Christmas' Opening". Blabbermouth.net. October 10, 2008. Archived from the original on October 13, 2008. Retrieved October 11, 2008. Jump up^ Goodman, William (October 17, 2008). "Evanescence's Amy Lee: "It's Not All Sad"". Spin.com. Archived from the original on October 18, 2008. Retrieved October 18, 2008. Jump up^ Fisher, Jason (October 23, 2008). "Evanescence Interview". TheGauntlet.com. Archived from the original on November 1, 2008. Retrieved November 1, 2008. Jump up^ Goodman, William (March 5, 2010). "Amy Lee on the New Evanescence Album". Spin. Archived from the original on March 7, 2010. Retrieved March 6,2010. Jump up^ Montgomery, James (July 11, 2011). "Evanescence's 'What You Want': Hear A Preview!". MTV News. Retrieved July 11, 2011. Jump up^ "Weezer, Paramore, Evanescence for Muppets tribute album". NME. June 27, 2011. Retrieved July 11, 2011. Jump up^ "'We Walk The Line: A Celebration Of The Music Of Johnny Cash' CD/DVD Coming August 7th". Johnnycashonline.com. 2012. Archived from the original on December 29, 2012. Jump up^ Lee, Amy (December 2, 2013). "I'm very excited...". Twitter.com. Retrieved August 14, 2015. Jump up^ Childers, Chad (January 8, 2014). "Evanescence Singer Amy Lee Mum on Lawsuit, Turns Attention to Film Scoring". Loudwire.com. Retrieved August 11,2014. Jump up^ Childers, Chad (August 6, 2014). "Evanescence's Amy Lee Teases 'Aftermath' Disc Featuring Music Inspired by 'War Story' Movie". Loudwire.com. Retrieved August 11, 2014. Jump up^ "Amy Lee - Aftermath (Teaser)". YouTube.com. August 6, 2014. Retrieved August 11, 2014. Jump up^ Lee, Amy (March 14, 2015). "Help create a new way...". Twitter.com. Retrieved March 15, 2015. Jump up^ Eggar, Dave (March 12, 2015). "In the studio putting...". Twitter.com. Retrieved March 15, 2015. Jump up^ Spanos, Brittany (November 5, 2015). "Evanescence's Amy Lee on Her Irish-Dance-Infused Sci-Fi Soundtrack". Rolling Stone. Retrieved December 17, 2015. ^ Jump up to:a b Lee, Amy (October 29, 2015). "@VoiceFromTheSto". Twitter.com. Retrieved October 29, 2015. Jump up^ "Excited to share...". Twitter.com. Voice From the Stone. August 13, 2015. Retrieved August 14, 2015. Jump up^ "Evanescence Coming to Dallas in November". KDGE.com. July 23, 2015. Retrieved October 27, 2015. Jump up^ Lee, Amy (October 27, 2015). "Please enjoy cover #1: Portishead's "It's a Fire"...". Twitter.com. Retrieved October 27, 2015. Jump up^ Lee, Amy (November 10, 2015). "Sometimes I dream in music...". Twitter.com. Retrieved November 10, 2015. ^ Jump up to:a b c Lee, Amy (December 15, 2015). "Cover #4: Baby Did a Bad, Bad Thing....". Facebook.com. Retrieved December 17, 2015. Jump up^ Lee, Amy (October 27, 2015). "Gotta give shout-outs to...". Twitter.com. Retrieved October 27, 2015. ^ Jump up to:a b Spanos, Brittany (October 30, 2015). "Amy Lee Talks Evanescence Reunion, New Music Plans". Rolling Stone. Retrieved October 31, 2015. Jump up^ Lee, Amy (October 31, 2015). "Of course not ;) ...". Twitter.com. Retrieved November 6, 2015. Jump up^ Hartmann, Graham (October 3, 2016). "Amy Lee: 'There Is Evanescence in the Future'". Loudwire. Retrieved December 3, 2016. ^ Jump up to:a b "Amazon Announces Lineup of Original Family Music Exclusively Streaming on Prime Music". Business Wire (Press release). June 17, 2016. Retrieved June 17,2016. Jump up^ Lakshmin, Deepa (September 14, 2016). "Amy Lee Goes Beyond Evanescence's 'Bring Me To Life' On Her New Solo Record". MTV News. Retrieved September 14, 2016. Jump up^ "Woodstock Reveals Slate, Mill Valley Unveils Lineup, Hamptons Picks Opening And Closing Night Offerings". IndieWire. September 15, 2016. Retrieved September 15, 2016. Jump up^ Lee, Amy (February 10, 2017). "When I was in Italy filming the video...". Facebook.com. Retrieved February 10, 2017. Jump up^ "Francesca Michielin: Amy Lee degli Evanescence canta “L’Amore Esiste” in inglese". MTV.it (in Italian). February 9, 2017. Retrieved February 10, 2017. Jump up^ Kreps, Daniel (March 17, 2017). "Hear Evanescence Singer Amy Lee's Ghostly New Ballad 'Speak to Me'". Rolling Stone. Retrieved March 18, 2017. Jump up^ "Amy Lee - Amy Lee Reunites With Mclawhorn As New Evanescence Takes Shape". Contactmusic.com. June 14, 2011. Retrieved January 23, 2014. Jump up^ "Evanescence Feeling No Pressure On New Album". Billboard. August 28, 2006. Retrieved January 23, 2014. Jump up^ Lee, Amy (January 9, 2007). "Amy's Engaged! : *clink clink* *ahem...*". EvThreads.com. Archived from the original on March 28, 2012. Retrieved January 9, 2007. Jump up^ Hill, Jack W. (January 19, 2012). "Amy Lee, band a far piece from evaporating". Arkansas Democrat-Gazette. p. 33. Retrieved January 22, 2014. Jump up^ Rubin, Courtney (May 10, 2007). "Evanescence Singer Amy Lee Gets Married". People.com. Retrieved January 22, 2014. Jump up^ Roberts, Michael (November 21, 2007). "Q&A With Evanescence's Amy Lee". Westword. Retrieved January 22, 2014. Jump up^ Rubin, Courtney (May 10, 2007). "Evanescence Singer Amy Lee Gets Married". People. Retrieved May 10, 2007. Jump up^ Childers, Chad (January 21, 2014). "Evanescence Frontwoman Amy Lee is Pregnant". Loudwire. Retrieved January 22, 2014. Jump up^ Leon, Anya; Gomez, Patrick (July 28, 2014). "Amy Lee Welcomes Son Jack Lion". People. Retrieved September 17, 2016. Jump up^ Duncan, Gabi (July 28, 2014). "Evanescence's Amy Lee Welcomes Baby Boy—See the Precious Pic!". E! Online. Retrieved September 17, 2016. Jump up^ "Evanescence's Amy shreads her threads!". Kerrang!. June 9, 2003. Archived from the original on March 14, 2005. Retrieved January 15, 2008. Jump up^ "Amy Lee – Instant Fashion Profile". MTV News. 2004. Archived from the original on November 12, 2006. Retrieved November 7, 2006. Jump up^ "Amy Lee - VEVO Stylized". YouTube. December 13, 2011. Retrieved November 29, 2012. Jump up^ Moss, Corey (June 10, 2004). "Evanescence's Amy Lee Hopes To Get Into Film, Rages Against Cheesy Female Idols". MTV News via VH1.com. Archived from the original on June 23, 2004. Retrieved November 7, 2006. Jump up^ Errico, Mike (December 2006). "Hottest Women of...Rock!". Blender. Archived from the original on January 6, 2007. ^ Jump up to:a b "NME Awards 2013 - as it happened". NME. February 27, 2013. Retrieved June 17, 2013. Jump up^ Geist, Brandon (October 11, 2011). "2011 Hottest Chicks in Hard Rock Issue on Newsstands Everywhere Now!". Revolver. Retrieved November 29, 2012. Jump up^ "Loudwire Awards: Rock Goddess of the Year". loudwire.com. Retrieved January 26, 2012. Jump up^ Graham, Mark (February 13, 2012). "VH1's 100 Greatest Women In Music". VH1.com. Archived from the original on July 15, 2012. Jump up^ "The Independent Music Awards: Nominees : Song : World Beat". IndependentMusicAwards.com. March 26, 2015. Retrieved April 18, 2015. Jump up^ "Family Choice Awards: Dream Too Much". Family Choice Awards. October 4, 2016. Retrieved October 4, 2016. Jump up^ Bond, Lahri (2017). "Dream Too Much by Amy Lee". Parents' Choice Foundation. Retrieved April 8, 2017.